RecipeTips.com's video on how to carve a turkey. For more cooking tips and advice visit RecipeTips.com. Hi! 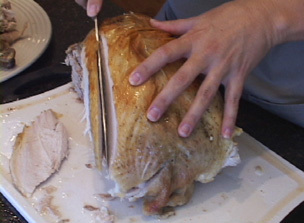 This is Laurie from RecipeTips.com, and today, I am going to show you how to carve a turkey. Carving a turkey is not as intimidating as it appears to be, so let us get started. First you want to start with a really sharp knife; that always helps. What you are going to want to do is remove the leg and the thigh from the rest of the body; so, using your knife, slice through in between the leg and the breast, all the way until you hit the bone of the thigh. Then, come down underneath and slide your knife right along the body until you hit that bone area, and you are just going to want to break it down with your hand until it pops. Now that you have your thigh and the leg removed from the body, you can go ahead and break these two into two pieces. Slice right in the middle, and there is another joint in there, and with your knife, just go in between the two, and go all the way through. The next step is to remove the wing. It is the same concept as with the leg. You want to bring your knife through where the wing attaches to the body, until you hit the joint. To find the joint, you might have to pull back on the wing until it pops, so it is easy to find exactly where to cut through. Once you have removed both the wings and the legs from both sides of the turkey, it is time to remove the breast meat. Place your knife along the bottom of the breast section, and slice all the way up until you reach the breast bone; then all you have to do is simply slice the breast meat, how ever thick you would like, straight down. For more information on cooking turkey, visit RecipeTips.com.